Patrick Priebe's laser watch will pop balloons and burn through plastic. (CNN) -- It cuts through plastic! It burns holes in walls! 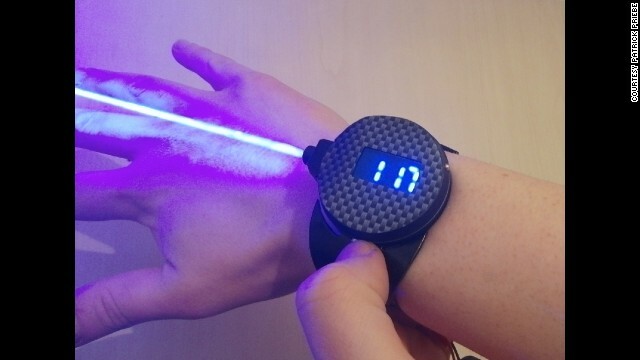 Like something out of a James Bond film, it's a watch -- equipped with a laser. Its inventor, Patrick Priebe, built it during downtime from his full-time gig creating props and modestly describes it as a "tiny watch made of garbage." The video has picked up more than 700,000 views since Priebe posted it five days ago -- not bad, though not as much as his Spider-Man "Webshooter" (2.1 million views) or his laser cannon prototype (1.3 million). Priebe, who runs a firm called Laser Gadgets, said he made the watch out of "leftovers." "I found a piece of leftover tubing, and I put it on my wrist and I realized it looked like a watch already," he said from his home near Cologne. After molding the tubing a bit more, "all I had to do was file down the edges to make the time module fit and cut something out for the laser module on the side, and it fit right away. It's just my style, putting things together without a plan." The laser watch has been compared to a James Bond device, but Priebe says it wasn't inspired by a particular Bond film -- not even "Goldfinger," with its famous scene of the villain aiming a laser at Bond's crotch. Instead, it was a Nintendo game of "GoldenEye," the video game based on the 1995 Pierce Brosnan Bond movie. "I'm not really a Bond fan," Priebe said, admitting that he prefers science fiction. Priebe, a former lab technician, is a now a full-time prop builder who's constructed pieces for the TV show "Warehouse 13," among other projects. He also makes money from YouTube views and been caught off-guard by the interest in the laser watch. He likes to personally answer YouTube comments and e-mail queries, and has gotten backed up with both. Incidentally, if you're interested in buying the watch -- you budding Dr. Evil, you -- too bad. It's not for sale, Priebe says. "There are some limits," he said. "I always say I don't make weapons. I just make toys."